***Only for the first 30 customers per store listed. Limit to one person per bottle. First-come, first-served basis. While stocks last. Please read these Terms and Conditions carefully before you enter this Exchange Program with Nutox. By entering, you are deemed to have accepted these Terms and Conditions and that you agree to abide by them. If you do not agree to these terms and conditions, please refrain from participating in this Exchange Program. This Exchange Program is open to all Malaysian citizens residing in Malaysia age 18 and above with a valid Malaysian National Registration Identity Card. The free Nutox Serum Concentrate 30ml given during this Exchange Program will only be available upon first come first serve basis while stocks last. i. Present any full size empty Serum/Essence bottle (minimum 30ml, all other Serum/Essence except Nutox) to participating Watsons and Mydin outlets (Sample packs will not be accepted). ii. Look for Tohtonku promoter at the selected outlet and exchange for the product. 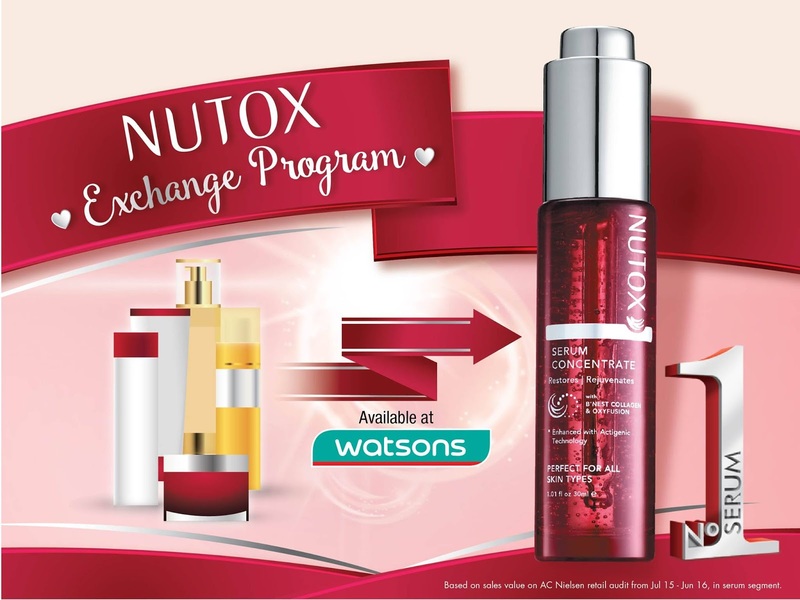 Each person is only entitled to exchange one (1) free Nutox Serum Concentrate 30ml only. Tohtonku Sdn Bhd reserves the right to disqualify any Participant who does not comply with any of these Terms and Conditions. All products are awarded “as is” and are strictly not for sale, non-transferable, and non-exchangeable for cash. Tohtonku Sdn Bhd accepts no responsibility for products lost or damaged due to any other error. Tohtonku Sdn Bhd reserves the right to vary, extend, suspend or terminate the terms and conditions of this Exchange Program at its sole discretion.